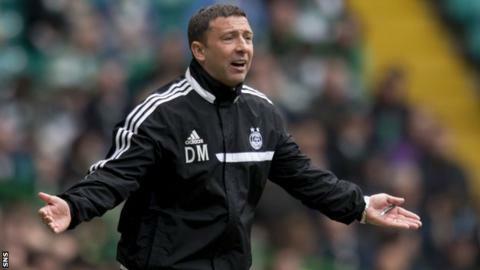 Derek McInnes feels Aberdeen were denied a penalty in the 5-2 defeat by Scottish Premiership champions Celtic. The Dons appealed in vain when Jonny Hayes tumbled under Efe Ambrose's challenge when they trailed 3-2. "It's a penalty kick. It's not only a penalty kick, it's last-man for Ambrose and down to 10 men," said McInnes. "Ultimately, Celtic scored some good goals and had some good performances and have the quality to pick you off." Despite the defeat, McInnes praised his Dons squad for securing European football for next season. "If you said at the start of the campaign we would have a cup in the bag and be back in Europe, we would all have been grabbing that," said the Aberdeen boss. "The players should be really pleased with their efforts and it's testament to how hard they have worked this season. So that's another box ticked and we've got two games now to grab second spot." Celtic took the lead when captain Brown rifled a fine shot past Jamie Langfield, but they were pegged back when Niall McGinn levelled. Brown netted again before the break and Antony Stokes fired Celtic's third. And, despite Shaleum Logan netting a ferocious drive, Commons put the result beyond doubt with two late strikes. Aberdeen believe their unsuccessful penalty appeal came at a "pivotal" moment of an entertaining encounter. "I thought at 3-2 the momentum was with us," added McInnes. "Effectively, it could be 3-3 playing against 10 men and it's game on. But we never, Celtic got the fourth goal and we were a wee bit open at that stage because you are as well going forward and having a go."